Then one day came that my zits became really stubborn and I put my foot down and decided it can’t be like this forever. There HAS to be a cost-effective way to get rid of them for good.. or at least keep them at bay. I definitely do not want to resort to spending thousands of pesos going to a dermatologist. I mean.. It’s ridiculous that I break out the next day after I eat something as good as a piece of well-done steak. Mmmm.. steak. A bit of background: I (believe I) have oily, or maybe combination skin. And given I am not exactly a healthy person, I think that also affects why I am prone to getting zits a lot more easily than most people. As for zits, I would get them whenever I eat oily, fatty foods, too much meat. Sometimes milk becomes a culprit, too. Definitely staying up late adds up to reasons why I get ’em. Lastly, chocolate breaks me out! Google says there’s no connection, science says the same thing.. but IDK, I just do when I eat chocolates. Boo hoo. Obviously, I’ve tried a lot of products already at that point. From the big-brand drugstore brands of anti-acne gels, creams, toners, and whatever-else-I-could-get-my-hands-on.. to the ones that are a bit hard to find and get like the “independent” skincare products that are often sold and promoted about in the local Instagram community. Basically I’ve went around from one product to another for months, to 2-3 years, changed my facial cleansing routines accordingly to the product I was trying out. Occasionally I’ve.. dunno if it’s the right term, “broke” my skin from trying products that are too harsh. It caused my face to peel really bad. I’m relieved it went back to normal after a few days, and that I didn’t have a reason to go out. Oh how mortifying would that be going out looking like the crypt keeper. I have also exhausted my pockets in search of the perfect anti-acne product for my face and skin. Not happy about that, but whatever. The search is over anyways. Other than Lush, I have tried Kiehl’s, and Body Shop’s Tea Tree Oil line. They were the brands I would consider to be the high-ends that I’ve given a try. They have worked but only for a short time. This was the Kiehl’s product that I tried: Kiehl’s Acne Blemish Control Daily Skin Treatment. I might do a separate review about it. The gist: It worked, but only for a short time. Also it was hard to see any results at first. I hardly saw any improvements, or I was just really impatient. One day, I found myself bloghopping from random makeup, fashion, beauty blogs when I stumbled at a post of a blogger doing a Lush product haul. I believe she was posting about her soap haul. I could care less about soaps but.. I guess I was bored at the time so I read all of it. The photos were especially nice to look at, and that’s what drawn me in. Then I thought of looking up the company, Lush, what do they do.. make.. whatever. Products and whatnot. Then I stumbled on their anti-acne line of products. 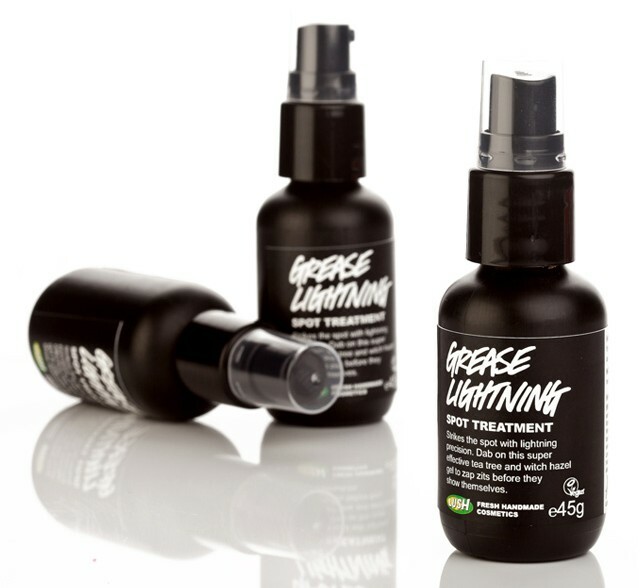 Then and there, Grease Lightning is their bestselling anti-acne spot corrector gel. There are other stuff in the line such as a toner and facial cleanser.. or was it a soap. Haha. After reading numerous reviews from MUA and a lot of blogs, I took the plunge and made my first Lush visit a week later. Hesitant to spend money again on something I am not sure if it would be effective.. but I went for it anyway. It was my only reason why I went out that day to the mall. I must’ve spent an hour or two inside the Lush shop carefully looking around each product before finally approaching one of the sales assistants and asking about Grease Lightning. People say that SAs in Lush are most accommodating and helpful. They are correct about that. The lady who assisted me was indeed a) talkative (but in a good way); b) suggestive without being forceful; c) engaging to talk to; d) casual talker. The whole experience didn’t feel like she was overselling me a product, nor was she talking to me for the sake of making a sale. My plan was only to buy Grease Lightning and Fresh Farmacy. The soap was supposed to be optional. I walked out of the store, with more items than those two. At the time of purchase, Grease Lightning costs P495. Fresh Farmacy is the soap that’s supposed to complement the spot corrector gel. Very sensitive soap, it had to be stored in room temperature and it mustn’t get wet unless you will use it or else it will melt. So for every time you use it, you have to dry it and store in a dry place after. I was very excited to head home and try them as soon as I’ve paid for my purchases. I had bought way more than I intended to buy. My ~Lush haul~ consisted of a bottle of Grease Lightning, Fresh Farmacy facial soap (bought the minimum amount, I think it was 100g), Honey I Washed the Kids and Karma soap pack. I only bought the last two because they were best sellers for the soaps, and why not? Although.. at the moment, I don’t use them that much and they’ve become incense in my room lol. I had it cut into tiny pieces, which is always recommended over there, for some reason. It’s to conserve the soaps and to be able to use them longer, since you’ll be going through it piece by piece. Each piece can be used for 2 weeks, or more, depending how often you wash with it. First off, the soaps don’t do much for me. They smell really good, yes. They also claim that the fragrance is long lasting. Not true in my case. It lasts longer as an air freshener in my room, lol. I think because of this, I won’t be repurchasing Lush soaps. The bath bombs look tempting, too, but nah, I don’t really need it. Moment of truth for the Grease Lightning Spot Corrector Gel: Well, it is a liquid gel you apply to the area where the zit is. The bottle suggests to apply it anywhere where a zit is on or about to have. It also says to apply it as often as you like. I, however, applied it as generously as I could. 😂 It numbed my face in the beginning, because it is gel after all, but I got used to the sensation after some time. It doesn’t last for a long time either. At first I only applied it on the affected areas, but eventually, whenever I use it, I put it all over my face. I didn’t notice any alarming reactions of my skin, in places where there aren’t any zits on, so I continued applying it all over. I think, it even made my skin clearer and immune to having zits since then. One more thing: It does not sting (at least for me). Trial and error, and the results..
How often did I apply this on my face? After I tone, which is usually only at night before I sleep. I have to stress this very important step: YOU HAVE TO APPLY THIS WITH CLEAN FINGERS. Literally after you wash your hands would be ideal, or else it’s useless methinks. There were no noticeable results at first. It probably only showed when I stopped paying attention but kept on using it as often as I could. The texture is also clear, so it won’t leave any visible residue anywhere upon applying. Maybe it was a month later when I noticed that the painters came in and I didn’t break out as badly as I used to. And that’s when I noticed it, upon closely looking.. they’re gone. Achievement unlocked moment. It was weird at first, haha, I was wondering why I wasn’t breaking out when I’m sure I’ve ate a lot of food that causes me to break out. I chucked it out to luck and right timing, but it’s been a few months since I started using this and some people have noticed that my face is now a lot clearer than before, which was nice to know of course. At last, the search is over and I’m done product-hopping. Happy to have found something that finally works for me. It was the best P495 I’ve ever spent, tbh. I like that my facial/skincare routine is simple and are less than 3 steps and yet it does everything I want. The basic steps, from what I read around are ‘wash, tone, moisturise’. I think I hardly do the last part.. I wonder if I’ll regret it at some point. But IDK, I just don’t see the need for it at the moment? Tone Does this count as a toner? It’s what I use before I apply Lush Grease Lightning. I think it’s a big stronger than Body Shop’s TTO toner.. because it stings whenever I use it, but it’s tolerable so I don’t mind. And that’s it. Two steps. Let me remind you though that this is what works for me. Following the exact steps of how I came about this facial care routine may or may not work for you. However, I recommend BIG TIME that you try Lush’s Grease Lightning especially when you’ve tried a lot of products to tame the beast (lol) and you’ve yet to reap from your losses. Very happy that I took the plunge, the risk, purchased a bottle. I would definitely repurchase as soon as I finish this one I have. Currently, in the Philippines, it sells for P495 a bottle. It only comes in one size, which I think is okay.. and I think the amount of gel inside is more than what you pay for. Would I recommend this product to anyone having the same or similar acne/zit problems? YES, YES, YES! Disclosure: This is not a sponsored post. The featured products were purchased with my own money. All thoughts and opinions expressed are my own, based on my experience upon using it. I also don’t wear makeup, just powder, mascara and lip balm, and I don’t have a long skin routine too, I just wash my face. Haha. However, I’ve been having breakout problems (well not that bad, just fee on my cheeks) lately, for reasons I’m not sure of, but I think it’s because of my teeth condition. Weird I know, but I’ve read something about face mapping (? ), I forgot. Anywayyyy haha I’ve tried Celeteque and Neutrogena, but I didn’t see any changes so I just stopped using. I know I should not go on a trial and error anymore because it may get worse, but I am really worried or hmm, losing confidence, maybe, or just annoyed with my face. Haha but the bigger problem would be the dark spots! When I read about this, I thought, maybe I could try this. And if this doesn’t work, I’ll give up. Haha. I think I have seen a branch in BGC, pero nalalayuan ako. Haha May I ask where you bought yours? I tried to google, but I think I’m getting wrong search results. Hope you could help me! 😊 Thanks! Hi! I bought mine at their Greenbelt branch. If you’re near Makati, they have branches in Greenbelt (medyo tago nga lang siya but it’s inside Greenbelt 3), or in Glorietta (hard to miss because you can smell it from National Book Store, sort of hehe). I forgot to note that the product has a different name here pala. In the Philippines, Grease Lightning is called Vanishing Act. It’s the same product, different name lang.. though I don’t know why. Good luck, hope it’s effective para hindi sayang ang pag purchase. 😊 I also tried Celeteque and Neutrogena, and same results din (or lack of it lol). Yes,Vanishing Act na nga yung name nya. Sabi pinalitan na daw talaga yung name. Dont know why. Also, may sinuggest sakin na soap, hindi fresh farmacy, yung isa na color black. Coal something yung name. Sabi un daw best partner ng vanishing act. But because you said the soap didn’t do that much, i didn’t buy it. But now im thinking of buying it, baka mas mabilis umeffect pag soap and vanishing act. What do you think? Sorry ang daldal ko nanaman sa comment. Haha. Yes medyo matagal ko nga nanotice yung results nung mga earlier times na ginagamit ko siya. 😞 I don’t know why it wasn’t as fast as it is now to work before.. but yeah mga month pa. Basta hindi agad agad. And yep, as often as I could ko siya inaapply. I figure, since all-natural naman daw ang ingredients niya okay lang ma-“overdose” in it din kaya yun. Haha, okay I don’t sound helpful now I think. I would look into the reviews first before buying one, if I were you. I check out Makeupalley for this.. :3 If naubos ko na yung FF, I would try this. Right now for facial wash I use either safeguard or Body Shop’s TTO facial wash. Recently namonitor ko yung effect niya. I didn’t apply it on a blemish for a few days and it just started getting bigger, tapos when I did, eventually lumiliit na siya and now it’s shrunk down and it’s not as red as it was when I didn’t apply this on. I am so getting one for myself because I’m using the Tea Tree Oil prods rin (but not daily because I’m lazy haha). But thanks for this Anna! I hope it works on me, too!